We don't give Christmas gifts the way other families do. We went bankrupt living in the Bay Area and trying to "keep up with the Joneses". We can't do that again. 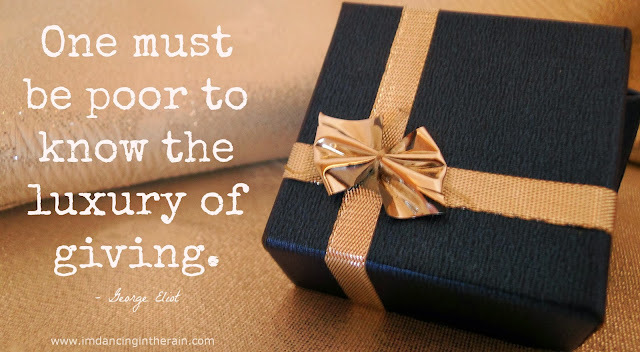 It really bothers us that we are simply unable to give every single person we'd like to a gift. For the last ten years since we literally went bankrupt, our Christmas gifts to family and friends have consisted of things like a nice card, family photos or pictures of the kids, things I've knitted or crocheted and the occasional small gift card or other inexpensive items. Mark and I rarely even buy gifts for each other. Often just a few stocking stuffers. We feel inclined to make Christmas for our kids more than for ourselves, so we put whatever resources we have when December comes into making the Holiday special for them first. I used to watch the Oprah's Favorite Things shows every year, I would feel so excited for those audience members who got to take home all of those wonderful things, even if I was secretly wondering if they were truly grateful or just greedy. I felt very happy when Oprah started filling the audiences for those shows with all teachers or all military families. And yet, even though I know Oprah is very charitable, and I've never gotten the impression she is a snobby rich person, I wondered why on earth did everything she counted as a "favorite" have to be so damn expensive? When I see holiday gift guides pop up all over the Internet at this time of year, I completely ignore them. I've even gotten emails asking if, as a blogger, I planned on putting together a Holiday gift guide and if so, would I like to participate in whatever promotional thing. Because I just know I cannot afford to buy anything on those lists. Why bother looking? Why torture myself with longing, either for myself or for what I can't give others? And putting a list together for you guys would be just about the most fake thing I could ever do here. I've tried to be the kind of person who spreads out gift buying throughout the year. I've told myself, "Jen, if you see something someone might like at a great price, grab it and save it for Christmas." But it doesn't work, because even month-to-month it's very hard for me to feel justified in spending money on people outside my little family. Birthdays are good reasons, but if I also tried to buy Christmas gifts and save them.....I might have to sacrifice birthday gifts. It's been a huge lesson in humility to accept what others want to give us with grace, when we're unable to reciprocate in the same manner. I've tried to tell people not to give me anything, to maybe just focus on the kids, but they still do and it's lovely. I never have expectations so I am always pleasantly surprised by my loved one's generosity. I just wish we could be more generous too. And I hope our loved ones know this. I hope everyone knows we would do more if we could, that we're not merely being stingy or thoughtless.